LATEST on Doki-watch - after a brief sojourn at Pacific Plaza, the not very successful successor to Oriental City, it seems Doki the beloved Japanese tableware shop is moving to Harrow Weald in August. Tetote Factory, its sister bakery, will also re-open in South Ealing next month. Doki will also be at HyperJapan - a massive event celebrating all things Japanese from today till Sunday at Olympia Two, London. "Doki was established in 1978 as Masyu Artware, and was then re-named Utsuwa-no-Yakata, before becoming Doki as it is known today.The Doki shop is moving now to a new premises in Harrow Weald in August. At HYPER JAPAN 2011 it will be presenting a selection of ceramics and pottery imported directly from Japan. Doki is written as 土器 in Japanese kanji characters, and means earthenware. 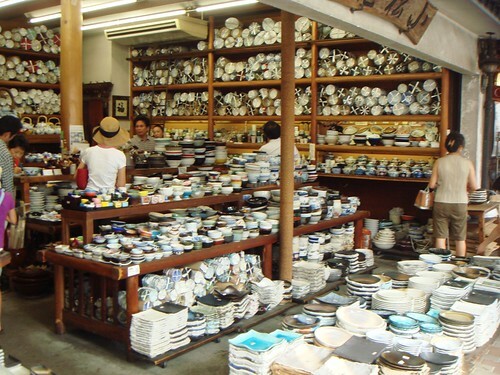 It is the term used to describe ancient Japanese earthenware, and Doki today provides people living in the UK with the opportunity to buy authentic, beautiful Japanese ceramics, cookware, glassware, lacquerware and more. Doki’s range of products is the most extensive in Europe, and the next best thing to going crockery shopping in Tokyo...". So that'll be you bankrupt then. . . I love Japanese tableware. I wanted to buy so much stuff when I was in Japan but didn't in the end out of fear of breaking everything. I so have to go there, thanks for the tip! Aa tetote, so fine so fine. @Kavey - I never made it to Pacific Plaza - will definitely need to make a pilgrimage to Tetote's new location. Oh crap. My cupboards are already full to overflowing. My husband is NOT going to be happy about this. Yes we open and please visit us in our shop located at Doki 207 high road harrow weald middlesex HA3 5EE 0208861 4277 or please our website www.dokiltd.co.uk.